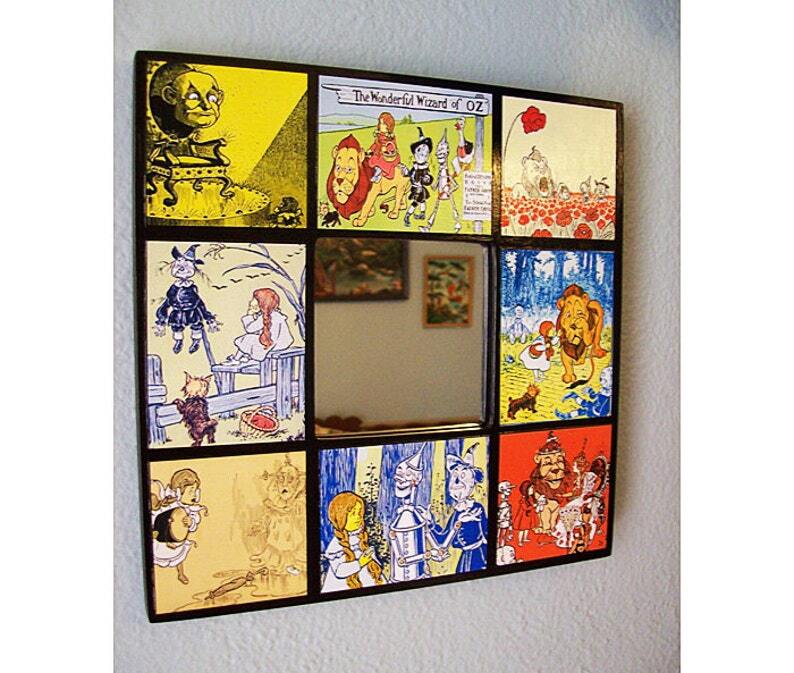 Add a little instant fairy tale kitsch to your walls with my retro wall mirror featuring images from the one and only The Wizard of Oz as written by L Frank Baum and illustrated by W W Denslow. the whole gang is here including Dorothy, the Scarecrow, Tin Man etc. The mirror and wooden frame together measures 10" square. I fabricate these mirrors with decoupage medium and polyurethane so the final product has a semi glossy surface that is easy to wipe clean. Beautiful wall mirror. Excellent craftmanship and fast shipping!!! Was a gift for a friend and she loved it. Packaging was very cute but there was some white sticky stuff on the back of the frame like there had been some sort of sticker there. A little goo gone got it off though.